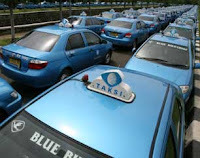 For the citizens of Jakarta is certainly familiar with Blue Bird Taxi, yes a fleet of taxis in the city of Jakarta bersleweran lot, and it is one of the many types of vehicles used by people in the capital Jakarta. Founder of Blue Bird Taxi is a female fighter from Malang Djokosoetono Siti Fatimah named Pearl who was born in Malang on October 17, 1921. Coming from a family is, but at the age of 5 years her family went bankrupt. Life changed drastically. From a little girl surrounded by rising living facilities became poor. he then climbing school in the extraordinary simplicity. Many things that characterize Bu Djoko simplicity of life as a child. There was never enough food, clothes on their backs, never spending money. Life really rests on the strength to persevere. Teens toughness honed. He was determined to enrich themselves with knowledge and intelligence. At a difficult time, he tried to embrace them much happier reading inspirational stories obtained by borrowing. One of the legendary stories that always cheer is "Blue Bird Story" or "The Bird Happiness". Devoured the story many times and always burning passion, inspiration sower and hyper ideals. Bu Djoko teens graduated HBS in the 30's and then pass the Educational Master Dutch or Europese Kweekschool. With strong determination he left home to wander into Jakarta. And successfully entered the Faculty of Law, University of Indonesia to move in with his uncle in Menteng. Then the way life takes acquainted with Djokosoetono, professors who taught, who is also the founder and Guberbur College of Police. The man that was married while still in college Dkoko Bu. Until blessed with 3 children, namely Chandra Suharto, Mintarsih Lestiani, and Purnomo Prawiro. Throughout the decade of the 50's, Bu Djoko with family missed a very simple life. After graduating from FHUI 1952 and went to work as a lecturer in FHUI and PTIK. They then occupied the official residence of the work of her husband in the HOS Cokroaminoto No. 107, Menteng. They were surrounded by a luxurious environment and the people with the establishment of material above average. While the family has only practical Djokosoetono needs money goes. To supplement the family income, Bu Djoko batik sell door to door. There was no pride, no shame, no fear denigrated by fellow wives of high officials. Everything was done purely as a caring wife to help her husband make a living. However, batik, which had a successful sales then declined. Until Bu Djoko tried turning the steering wheel in front of her eggs. Reality selling eggs into a brilliant business option period. When the egg is not as popular now. Still considered the exclusive preserve foodstuffs consumed only the upper class people. With agile Bu Djoko looking for the best egg supplier in Kebumen. Slowly eggs Bu Djoko businesses and families continue to increase. The excitement will be a business success foggy thinking ill because sadness Pak Djoko though the government gave full support to Pak Djoko care costs. However, Pak Djoko disease does not go away, until finally on September 6, 1965 he died. Not long after the departure of Mr. Djoko, PTIK and PTHM apprise a reasonably entertaining family. They get two cars, Opel and Mercedes sedans. Here is the birth embryos Blue Bird Taxi. One night, Mrs. Djoko started designing ideas for taxi operation that starts with two pieces owned sedan delivery. He imagined his taxi into a beloved passenger transport. What is the taxi business? Certainly he craved the security and certainty. What is the heart of the business? Service, nothing more. Then how that business was not only successful but also serve passengers successful in getting benefits? Make a neat management. In very simple discourse, Bu Djoko draft to run his taxi business. After thinking about the car and how to manage, he thought the driver. How to create work rules so drivers feel in love while on duty? Bu Djoko quickly answering his own question. He treats them like his own children. The driver will be well educated, nurtured, embraced to equally develop. After being poured on the things he was doing, Mrs. Djoko asleep with a happy feeling. This is an important phase in the history of the birth of Blue Bird. That is when Mrs. Djoko stared start a taxi business in the design of idealism that he has made. Although capital two cars, but his vision was far ahead. Assisted by three sons and a daughter then began dark Bu Djoko taxi business. Interestingly the taxi business stretcher use tariff meter system which was then not in Jakarta. To order a taxi, he used his home telephone number. Because Chandra assigned received a call from the customer then people call a taxi cab Chandra. Taxis are only two Chandra sedan then sped popular in Menteng neighborhood as outstanding service. Order appears endless. From the results of the current gain, the BU Djoko can buy the car again. The combination of Bu Djoko highly disciplined and full of passion in running their business in harmony with nature Chandra careful and quiet. All the problems in running a taxi business brought in a family meeting to find a solution. Demand for Taxis Chandra continues to flow. The effort was originally intended to safeguard the economic stability of families, and then developed into a serious business. Some of the cars that have been owned deemed insufficient. Widening the service point, not only in the Menteng area, tebet, Kabayoran New and territories in Central Jakarta, but also to the East Jakarta, West and North. At the end of the era of family dlamiah Bu Djoko preparing asawarsa 60s naturally entered an important new phase. A phase where the business of life is no longer just a "family activity" for emnambah sustenance. In the years leading up to 1970 relaita prove that they are capable of memebsarkan fleet and gain a significant advantage. They can increase the amount of own car more than 60 pieces. Entering the decade of the 70s, a resounding news. Ali Sadikin, Jakarta Governor Jakarta when it announced it would impose operational clearance for the cab. Based on the fact that the people of Jakarta in desperate need of a taxi. This opportunity is responded to with an uncanny instinct of Bu Djoko. Then enter 1971, with full spirit he soon left for DLLAJR to obtain operating permits. But the anti-climax of hope, Bu Djoko always rejected for business reasons he was little. Indeed, at that time a permit is mendaptkan companies that have run large freight business. But Bu Djoko figure that is relentless. Countless times he always experienced rejection. Until a brilliant idea occurred to collect wives widows heroes who have left their cars to run as taxis. Diajaknyaa widows heroes to jointly petition calling for the ability of women in business meimpin. They went to the office and facing directly gebernur Ali Sadikin. Facing oration Bu Djoko, Ali Sadikin touched and set the Bu Djoko granted a business license to operate a taxi. It was an exhilarating achievement of patience commute DLLAJR lobbying, although eventually have to go through a meeting with the Governor. Bu Djoko was not interested in joining. He was more thinking to find a way for the independence of his business. There's no other way to contact the Bank. What happens invicible touch kemudiana dalah working hand in facilitating Bu Djoko gets bank loans. Former pupil of her husband quickly help smooth the process in the Bank and the loan was mengalir.Bagi Bu Djoko an incredible. On paper it difficult to get sufficient funds to buy 100 cars. But by then he could! In the same year Mrs. Djoko and his children getting a taxi to find a name and logo. Chandra still run as a taxi cab by the hour or hourly. While the new taxis under PT Eight Year Period Taxi immediately prepared his name. The idea was again coming from Bu Djoko, until diberilah name Blue Bird taxi. With a simple logo silhouetted dark blue bird was shot, the work of sculptor Hartono. Logo is like accomplishments prove that he was able to revive the ideals of the example of the story of The Bird of Happiness. On May 1, 1972, the streets of Jakarta from taxis colored blue with the logo of a bird that was shot. Taxis that reflects the spirit of labor and idealism that fueled Bu Djoko. Together with the team at PT. Taxi eight years, was steady Ournomo duty operations. It could be said the year-the 70's is a time of idealism formulation Blue Bird. In simplicity Bu Djoko lead the way to bring the Blue Bird is ready to wade era. He instilled in freight crew how to cultivate a high sense of belonging to the Blue Bird to be "soldiers" tough and full of sacrifice. They enjoy a very understated period where technology has not touched the Blue Bird. In the second half of the decade of the '70s, Blue Bird fleet strength has increased to about 200 more cabs. Management of an extremely rapid ehat yangs family management allows PT. Eight years that houses Blue Bird Taxi increase its fleet. The cars were placed in two pool Yanga da, on the Garuda, Kemayoran and on the road Mampang Prapatan. Purnomo trusted to lead the Blue Bird as operational ditektur, after his brother Chandra focus on PTIK. After going through years of tough in enforcing idealism in the era of the '70s, the next decade from irradiated stronger optimism. The values ​​and principles that is attached to the Blue Bird Bu Djoko has roots and produce healthy stems and branches. Entering the decade of the 80s, Purnomo, Mintarsih and Mrs. Djoko further strengthen the cohesiveness. Chandra is sometimes involved in the discussion after the preoccupations in PTIK. Remaining problems from previous years is still a scourge and a few crucial issues. But Purnomo already dimatangkanoleh 70s-era experience was much more confident to face the difficulties in the field. Purnomo spent the early years in the decade of the 80s with extraordinary money working hard. After 8 years to survive, businesses face is clearly visible. Blue Bird could measure themselves whether or not to continue traveling. Bu Djoko and his three children are determined to move on. In 1985, 13 years after the Blue Bird was born, the fleet grew fatter, almost reached 2,000 taxis. Djoko BU belief that society will eventually steady pick Blue Bird with proma service quality and reliable system agrometer formed. And true! When that comes up a lot with no metered taxis. When people choose a decent taxi meter, the choice fell on the Blue Bird who has dogged run agrometer system for a dozen years. Entering the second half of the decade of the 80's you could say Blue Bird continues to establish itself. Appreciation of the form, the image of a Blue Bird taxi ternyaman, the safest, the driver was polite and well known to be a deep-rooted belief. This is the period in which the operator is busy serving the Blue Bird membeludak consumer demand. The number continues to grow cab approaching 3,000 units. Order continues to increase. Blue Bird no doubt be the choice of the owners of the buildings seabagai official taxis in their place. Blue Bird flying in many important points in Jakarta. Progress for the sake of progress could not be stopped at the Blue Bird body. Management neat, idelisme guarded, financial arrangements are very mature and wise expansion strategy, Blue Bird made the pace of progress is so organized and very pretty. The combination of the power of charisma Bu Djoko, Purnomo aggressiveness and creativity, as well as peace of Chandra strategy makes Blue Bird in the era of the 90s showed a healthy development. Factors affecting the progress of the Blue Bird of this era, no doubt is the advancement of public perception. Bu Djoko really appropriate predictions about the future of the taxi company. That later in AHRI, people will look for, need, and a fanatic on the taxi service quality-tested, safe, fit and nayaman. A meter used ajdi scourge and is considered a "castle in the air" was not proven. Precisely metered Blue Bird used to be the most fair standard passenger sought. This is an important record of the struggle Bu Djoko in targeting future success: patience, firm in principle, stern and wise leadership and professionalism. After perjauangan weight in the era of 70's and 80's, the era of the 90s gave the Blue Bird Group sugary sweet fruit. The development of assets is the most prominent when discussing the progress of Blue Bird in the 90's era. The number of taxi before krismon reaching nearly 5,000 cars. Number of pool continues to grow. Blue Bird is growing in some province. Generation of the 90s eventually come to feel how tall amid the terror siege that do not like the presence of the Blue Bird. A new innovation is also done through the launch of Blue Bird Group Silver Bird executive taxi in 1993. In other countries there is no such thing as executive taxi. General circulation is a taxi with rate limit that has been set by the government. The idea was started by the holding of the Non-Aligned Summit held in Indonesia in 1992. When the government provides facilities for the mobility needs of luxury cars all participants KK, the Nissan Cedric 320 sedan. The government finally appointed Blue Bird provides 320 reliable and experienced driver. After the summit, hundreds of idle luxury sedan. When the idea was born to create a new product in the form of executive class taxis are more luxurious. Finally, Blue Bird bought 240 of the 320 luxury sedan ex summit and make it as Silver Bird. Dated May 1, 1997, Blue Bird also inaugurated the birth Heritage Group which is intended to be a fresh generation and dynamic of the existing taxi fleet. The presence of the roll cab Heritage Group Heritage Nuri paradise and was originally a Blue Bird aspiration to deliver a new generation of Blue Bird is more modern. As a conservative company, Blue Bird to be very careful launched a new business that can not be secured his future fate. So mantaplah then born Heritage Group as a subsidiary of a more dynamic, not conservative, aggressive moves in the region and is managed purely by the family Bu Djoko. Heirlooms Group had shown its success. Furthermore founded Golden Bird operating in Bali. Followed by other areas such as Surabaya, Bandung, Manado, Medan, Palembang, and Lombok. In the decade of the 90s Bu Djoko health declined due to attack lung cancer. His figure was felt cornered excited by the disease. While continuing to lead the company, Mrs. Djoko provides a lot of time, attention and energy to cure illness. But lung cancer ddideritanya too wild for her aging. On 10 June 2000, she closed her eyes at the hospital Medistra. The Blue Bird was gone. But he left something that was never lost time. Pure spirit is not only stored in Ahti children and grandchildren, but also flowing in all the inner tens of thousands of employees, the air in buildings and pool and dashed bersma Blue Bird taxis Blue Bird who crossed streets. Blue Bird in the Millennium era like a high-flying bird, spreading its wings flap and reaching wider horizon. The presence of the grandchildren, Chandra and Purnomo emningkatnya experience and semangkin high flying hours employees make this company the best in its field. In the fourth decade of Blue Bird struggled through the era of advanced technology and try to be flexible. The company has grown in such a way as seeds grow strong stems and produce lush foliage with branches that continue to multiply. From the beginning of the passing of a cab with 25 strength, now Blue Bird has more than 20,000 units of the fleet. Now there are 30,000 employees working in the head office and branches. No less than 9 million passengers in a month transported by a fleet of Blue Bird in several cities in Indonesia. Total pool has reached 28 points. Armada also continues to be rejuvenated. Several times to replace it with a new vehicle. Silver Bird Armada which was originally used Nissan Cedric sedan later replaced with Mercedes in 2006. A remarkable breakthrough astounding.